A locked Windows PC? 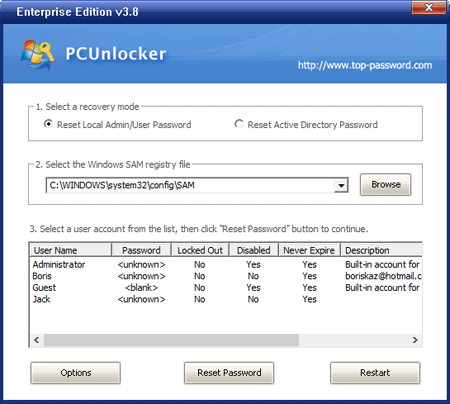 Never fear – PCUnlocker is here! Somebody played a prank on you and left your computer with a password. Either way, all these situations are pretty annoying, as it is very difficult to survive today’s modern world without having a fully working computer. Thanks to PCUnlocker, none of these problems will get in your way. Reset forgotten domain administrator and user passwords for Windows 2000, 2003, 2008, 2012 and 2016 AD (Active Directory) domain controller. Ability to remove login time restrictions on Windows local account and Active Directory account. Support password reset for Windows 10 / 8 local accounts and Microsoft account. 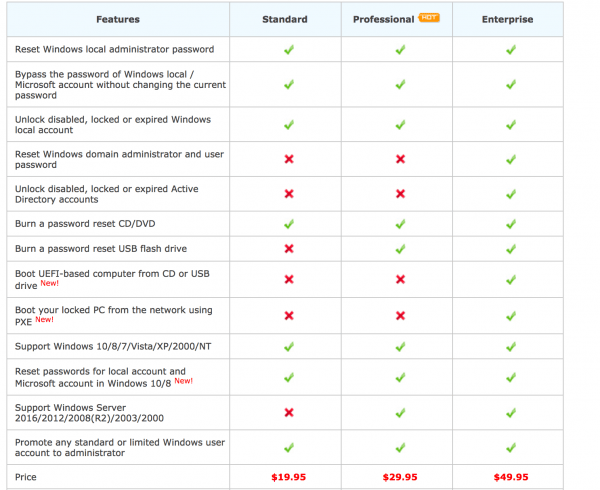 Reset passwords for Windows 10, 8.1, 8, 7, Vista, XP, 2003, 2000, NT, Windows Server 2003 x64 Edition (64-bit), Windows 7 64-bit, Windows Server 2008 / 2012 / 2016. The software comes in three editions, depending on what kind of usage you are after. More information on the software can be found on their website.